In honor of President’s Day, this post is about the White House which is located at the famous address of 1600 Pennsylvania Avenue in Washington, D.C. The White House has been the executive offices and the official residence of every President of the United States since 1800, George Washington never lived in the White House and John Adams was the first president to occupy the residence. Part One of series will discuss the history and the building’s design and architecture. Part Two will give a tour of the White House and detailed information about the various rooms, such as the Oval Office, the Red Room and the Blue Room. Part Three will give a tour of some of the rooms on the second floor of the White House where the famous Lincoln Bedroom is located. I will also discuss the Oval Office which is located in the West Wing of the White House and is the official office of the President. During the first months of his term in office George Washington, the first President of the newly formed United States of America, lived in two different houses located in New York City, NY from 1789 to 1790. In December 1790, the national capital moved temporarily to Philadelphia, PA while the new Federal City (later to be known as Washington, D.C.) was being built. Washington lived and worked in a house on Market St. for the remainder of his first term and also for his second term. When Washington surprisingly decided not to seek reelection he happily retired to his Mount Vernon home in Virginia. John Adams, the second elected U.S. President, moved into the Market Street house in Philadelphia until November 1800 when he moved into the newly built President’s House (later to be known as the White House) which was located in the nation’s new capital. 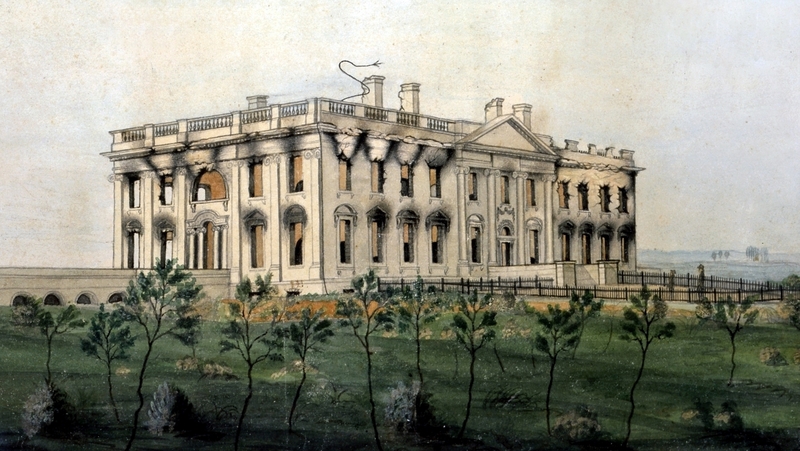 The White House was one of the most prominent buildings in the newly established national capital which was being designed by Pierre Charles L’Enfant. In 1792, a commission had been formed to determine the best design for the new President’s House and nine proposals were received from prominent architects, including Thomas Jefferson who submitted his own design anonymously. The final design selected was by an architect named James Hoban but unfortunately his original drawings from the competition no longer exist. The cornerstone was laid on October 13, 1792 and construction quickly started on the house using a work force of mostly African-American laborers. The exterior of the grand and elegant mansion was designed in the neo-classical Federal style and at the time that it was completed it was the largest residence in the United States. 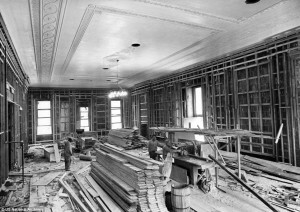 Building supply shortages caused many alterations to the original plan and the construction took eight years to complete. The sandstone walls, although sturdy proved to be very porous material and they were whitewashed with a mixture of lime, rice glue, casein and lead that gave the mansion its white appearance and eventually its famous name. When President Thomas Jefferson took office and came to live in the White House in 1801, the interior of the house was still not finished. He quickly set about having improvements done on the house, such as indoor “water closets” (earlier version of toilets) and he built horse stables and servant quarters which were concealed by the East and West Colonnades. 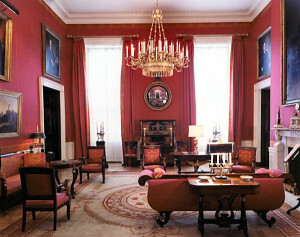 In keeping with Jefferson’s inquisitive mind and various interests, he created a simple museum in the Entrance Hall of the White House containing plant and animal specimens and Indian artifacts and in the Dining Room he had a revolving cabinet built, these features were very similar to the way Jefferson lived in his beloved Monticello. During Jefferson’s two terms in office he brought a sense of sophistication to the White House and he entertained frequently with lavish multi-course dinners served with the fine French wines. At the time of President James Madison, the United States was at war once again with Britain. During the War of 1812, the famous story goes that First Lady Dolly Madison quickly gathered important historic documents and the massive painting of President George Washington before escaping as British troops came marching into Washington, D.C. 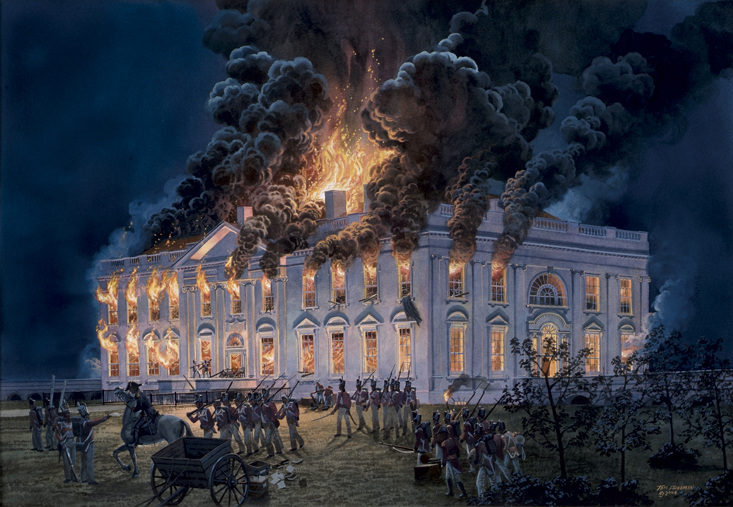 The end result was that the British set fire to many buildings within the nation’s capital and the White House was burned down leaving the interior rooms completely destroyed by the fire and only the exterior walls left standing. After the war, the original architect of the White House, James Hoban, returned to supervise the reconstruction. The restoration was completed in 1817 and at that time, President James Monroe had the interior furnished in a grand and regal style. Throughout the different presidential administrations over the following years, minor architectural and interior decorative changes were made to the White House. In 1824 the South Portico was added and in 1829 the North Portico was added to the White House. Additional changes followed in 1835 when interior running water and central heating were installed. During the time of President Ulysses S. Grant, the interior decorations of the White House reflected the cluttered Victorian style, Tiffany glass windows and gaslight fixtures were added and eventually replaced by electric lights in 1891. At various times during the history of the White House, major expansions have been proposed but never happened until the time of President Theodore Roosevelt. 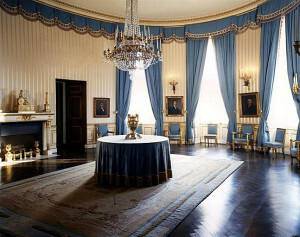 In 1902, Roosevelt had removed all the previous garish Victorian décor and returned the White House to the original interior design in Federal style with some Georgian elements. 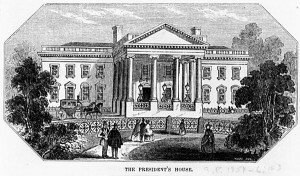 The first West Wing was built as an addition to the White House and for the first time this allowed a separate set of offices for the presidential staff and as a result the President and his family were given more private rooms on the second floor. In 1917, President Woodrow Wilson had part of the attic renovated to include some additional guest rooms. Ten years later, during the time of President Calvin Coolidge, in 1917 a heavy rain storm caused severe damage to the roof of the White House. The roof and the attic were restored and the third floor was re-enforced with steel beams. 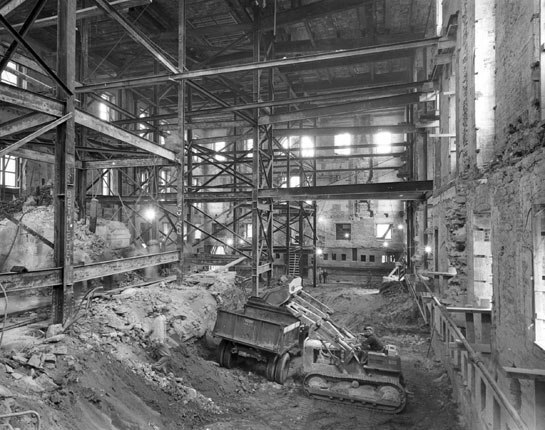 In 1948, President Harry Truman added the much debated balcony to the second floor of the South Portico. Despite the initial controversy that the balcony was not architecturally pleasing to the appearance of the White House it has since become a favorite area for the Presidents and their family to relax and enjoy some private time or intimate entertaining. 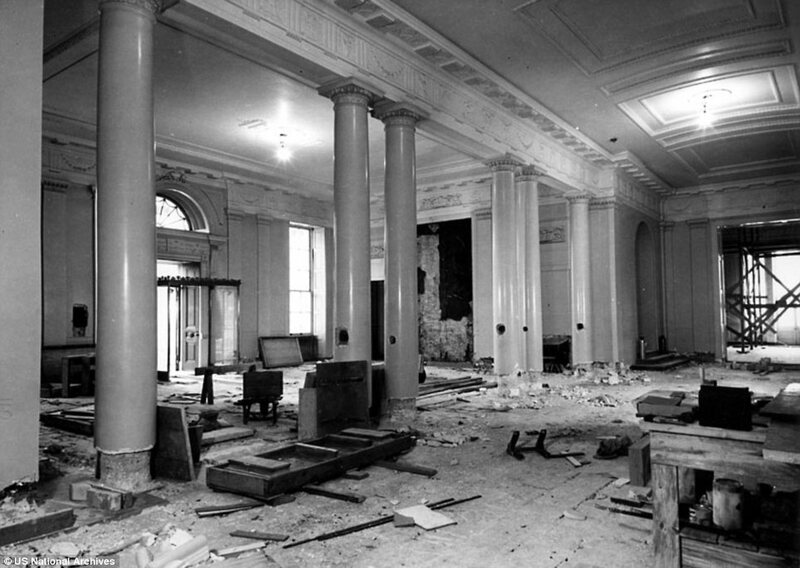 All of the renovations and redecoration of the White House over the previous years actually left the White House in a extremely weakened condition. There is a famous story that shortly after the completion of the South Portico balcony in 1948 the piano of President Harry Truman’s daughter, Margaret, almost fell through the second floor. 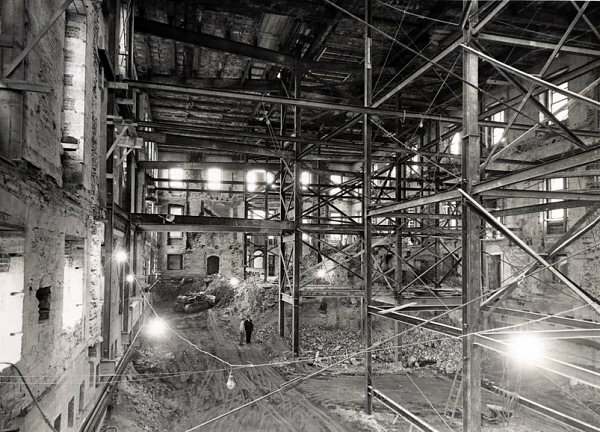 This prompted a complete assessment of the building and it was found to be structurally unsafe and as a result the Truman family moved across the street into Blair House while the White House interior was completely demolished leaving only the outer walls intact. Over the next three years the interior originally made with wooden beams that were now severely rotted were replaced and the floors were constructed using concrete and steel beams. The reconstruction included many modifications, such as additional bathrooms for each of the bedrooms and two additional basements were also built to provide more offices, storage and a bomb shelter (remember World War II had recently ended and the security of the nation and the safety of the President were top priorities). The grand staircase was also repositioned from the Cross Hall to Entrance Hall; visitors will recognize this area of the White House from the news coverage of the President and First Lady ceremoniously descending the staircase from the private second floor with the various visiting heads of states to begin Official Ceremonies and State Dinners. 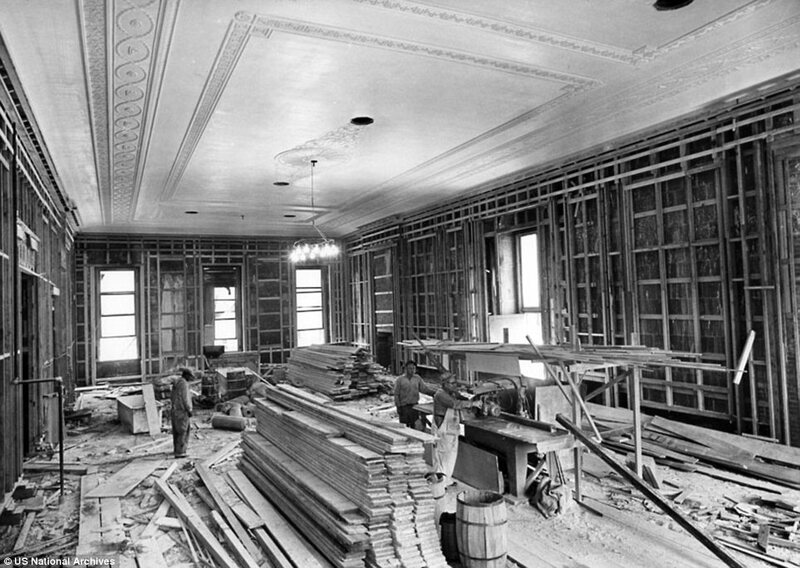 The ever practical Midwestern President Truman had the original timber beams made into wood paneling for the China Room, Map Room, Vermeil Room and Library of the newly reconstructed White House. 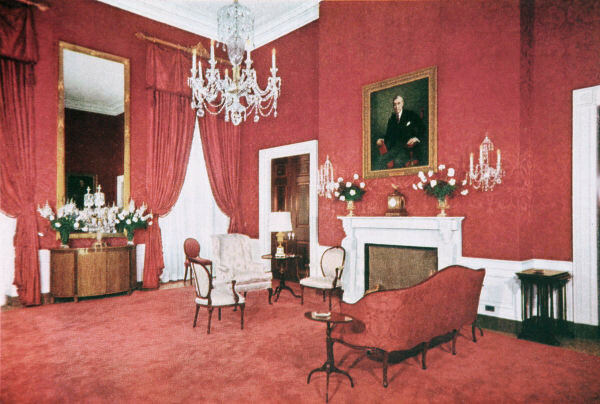 Perhaps the presidential administration that has changed the interior design and furnishings of the White House most significantly was during the time of President John Kennedy. 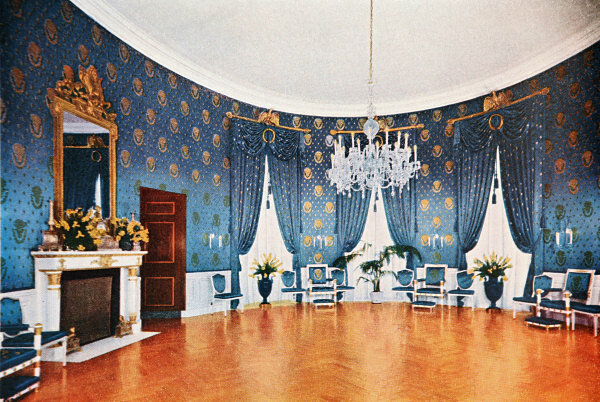 Over the preceding years, much of the White House had become a mix of contrasting styles of antiques and furniture from several different decades and there was no cohesive decorating plan. Mrs. Jacqueline Kennedy, who was known for her impeccable sense of refined decorating style, was appalled at the condition of State Rooms of the White House. She put careful thought into preserving the history of the White House and as a result of this massive project the White House Historical Association was created to aid in the preservation and restoration of the formal State Rooms. The first step in this ambitious plan of restoring the White House was to raise money to finance the project. This was accomplished with the first comprehensive White House Guidebook being written and printed under the direction of Mrs. Kennedy and the first White House curator, Lorraine Waxman Pearce, and the guidebooks were sold to the public to help finance the project. Next, Mrs. Kennedy scoured the large White House storage facilities to see what furnishings and decorations were available, some great pieces were found hidden there and these items were cleaned and refurbished. Next, Mrs. Kennedy looked into the Smithsonian Art Museums for paintings and decorative items that could be used in decorating the White House; this proved to be a great resource and numerous items were loaned for the project. Then, Henry DuPont of the renowned Winterthur Museum was enlisted to assist Mrs. Kennedy in collecting artifacts and furnishings that had previously been used in the White House. This was a lengthy and tedious process but soon more hidden treasures were found and/or donated. Also Mrs. Kennedy used many of her private social connections from wealthy philanthropists to fund the project. In general, Mrs. Kennedy selected different periods in the early history of the United States and the World. 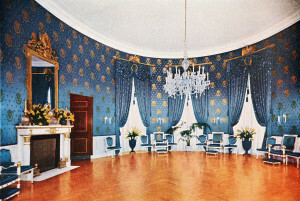 The themes selected were: The Green Room had a Federal style, the Blue Room had a French Empire style, the Red Room had an American Empire style, the Yellow Oval Room on the second floor had a Louis XVI style and the President’s Study (later known as the Treaty Room had a Victorian style. The rooms were furnished with appropriate antique period furniture and decorative fabric and room trim was based on period documents and reproduced for the different rooms. The Diplomatic Reception Room has an interesting story of an 1834 “Vue de l’Amerique Nord” wallpaper which was acquired from a house that was going to be demolished, it was salvaged and then sold to the White House. To promote the restoration project and gain public approval for the project, Mrs. Kennedy enlisted the help of Life magazine and an article appeared in the September 1961 issue. Then, when the restoration was completed, Mrs. Kennedy appeared on February 14, 1962 in a special CBS program in which she gave a guided tour of the White House; President Kennedy also made a brief appearance on the program. President Richard Nixon – The indoor swimming pool was converted into a new Press Briefing Room and a one-lane bowling alley was built in the basement of the White House. President Gerald Ford – An outdoor swimming pool was added to the White House grounds. President George H. W. Bush – The White House exterior was extensively refurbished, 40 layers of paint were removed and the sandstone exterior walls were repaired and then repainted. President Bill Clinton – In preparation of the 200th anniversary of the White House, many of the State Rooms were renovated and redecorated. The White House also implemented a “Green Project” to reduce energy consumption and improved environment opportunities to use renewable resources. President George W. Bush – The Situation Room (originally added to the White House by President Kennedy) was expanded and updated with the latest technology available. President Barrack Obama – In 2009, First Lady Michelle Obama had an organic vegetable garden planted. In 2013 solar panels were installed on the roof of the White House which were used to power the president’s private living quarters. For additional information and a detailed tour of the White House including the various State Rooms, such as the Oval Office, the Red Room and the Blue Room, please click on the link to the White House – Part Two. White House – Part Three will give a tour of some of the rooms on the second floor of the White House where the famous Lincoln Bedroom is located and I will also discuss the Oval Office which is located in the West Wing of the White House and is the official office of the President. For information about the two additional presidential landmarks located in Washington, D.C. which were featured this month in honor of resident’s Day, please click on the links to the Lincoln Memorial and the Washington Monument. This entry was posted in Travel and tagged burned do, Did George Washington live in the White House?, Dolly Madison, Harry Truman, James Hoban, James Madison, President's Day, the history of the White House, the President's House, The White House, Thomas Jefferson, Travel, Travel in Washington DC, When did the White House burn down, when was the White House built, When was the White House renovated, where is the White House located, White House Historical Association, White House restoration by Jackie Kennedy, who built the White House, who burned down the White House, Who was the first President to live in the White House, Why was the White House renovated by barbara. Bookmark the permalink.